"The dead are dead. He's gone. What's left to ever say he was here at all?" Director Mike Hodges has an affinity for character-driven thrillers, many of which defy the conventions of their genre. Previous projects include the original Get Carter and the stylish gambling thriller Croupier, starring a suave, mysterious Clive Owen. That film had its share of strengths, garnering strong critical acclaim, but suffered from several unnecessary plot twists. The project proved to be a worthy vehicle for the now famous Clive Owen, whose face is becoming more and more common in American films, including King Arthur and the upcoming Closer. I�ll Sleep When I�m Dead proves his continual affinity for small, unique pictures that avoid the blockbuster formula with admirable results. Will Graham (Owen) has seen his fill of crime and blood, retiring from his gig as a gangster some three years prior. Living in his van, he prefers the quiet tranquility of the woods to the urban jungle he once prowled. Scraggly, unshaven and working for a lumber company, Will has changed, labeled a �pikey� by some and seen as reformed by others. His brother, Davey, is still in the game, selling drugs at high profile parties to high profile clients, enjoying his shady life to the fullest. Others notice, however, including Boad (Malcolm McDowell), who becomes fixated on the young man�s assets. On his way home, Davey is brutally attacked and raped, leading to his death in a most unexpected manner. Will briefly spots his brother in a transit station, knowing full well he is not there. Was it his spirit? Something is wrong. Emerging from his wildlife hideaway, Will returns to the city to visit his brother, only to learn the tragic news. He catches up with former confidants Mickser (Jamie Forman) and Helen (Charlotte Rampling), mourning Davey�s death and the death of years past. Helen mourns something more: Her past romance with Will, leading her to plead for police involvement�she does not want to see a bloodbath ensue, but she is ultimately powerless to stop what is coming. Mickser is the typical henchman type, trigger happy and thirsting for revenge. Will�s demeanor is far more controlled, cool and calculated, but he ultimately shares his goal: Justice for a brother lost. I�ll Sleep When I�m Dead is not outstanding, but is a strong film that goes beyond the typical revenge thriller, opting for a visually-driven meditative tone that works. Unlike The Clearing, which attempted to use such devices with little written support, Mike Hodges' approach is quietly disturbing in its methodical pace and sparse, yet well-constructed dialogue. There is a palpable momentum that saturates this picture, making way for few surprises, yet it managed to pull me in. I was especially taken with the film�s unconventional use of voiceover, which features conversation, not always narration, over images that further advance the plot; it�s this kind of layering that makes the experience worthwhile. 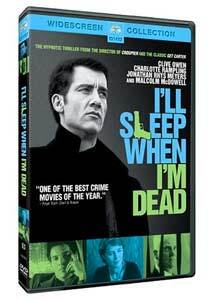 Clive Owen is superb at on-screen brooding, and he gives Will Graham a great sense of history throughout. I�m impressed at his ability to emote and capture critical moments with nary a word�only a glance is needed. Malcolm McDowell�s character is sadly underdeveloped, only appearing in a few gut-wrenching scenes. Supporting roles from Jamie Forman and Charlotte Rampling enhance the ensemble, but the real star here is Owen, who transforms from Paul Bunyon to gangster Will Graham with convincing authenticity. His character testifies to the idea that people can change their ways, but an important question remains: Do they ever leave behind what they were before? Image Transfer Review: Paramount�s transfer is superb. Colors and contrast are rich and rock solid. Detail is high, and film grain is minimal, creating a very pleasing, clean transfer. There is some edge enhancement here and there. Both urban and natural environments are well-rendered. Audio Transfer Review: The Dolby 5.1 track is appropriately front heavy. Being a dialogue driven film, this does not lend itself to an active surround mix. The rear channels are used primarily for ambient fill, but there is good dynamic range throughout, especially during the slick opening credit sequence. Extras Review: Sadly, the only extras are the trailers listed above, presented in nonanamorphic widescreen. The trailers are forced when you play the disc, but can be skipped. Mike Hodges' sleeper noir features a methodical, visually driven tone, and another memorable performance by Clive Owen. It manages to eclipse the standard gangster/revenge fare. Paramount�s disc has fine a/v quality, but no features.